The new Blackbox GO is a very rugged 2-way Radio. It is Dustproof and Waterproof with a I.P. 56 rating. The GO is certified by the FCC, Canada's IC and Mexico's IFTEL for Vibration, Sand, Salt, Water, Shock, Pressure and Temperature resistance. 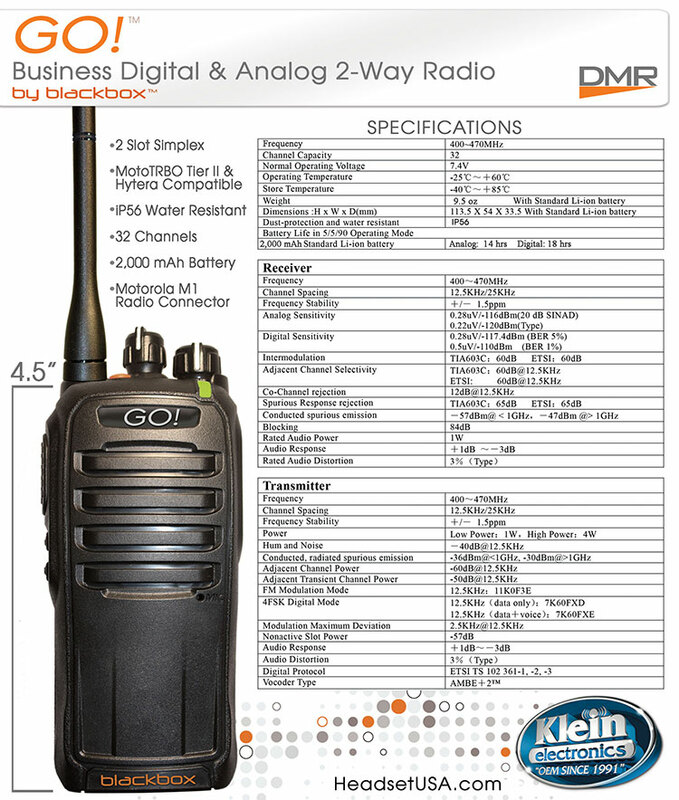 The GO Radio is MotoTRBO Tier II and Hytera Network compatible and is built to Digital Mobile Radio standards (DMR). This radio is a great choice for Manufacturing, Warehouse, Hospitality, Security, Construction and much more…UHF radios work best INDOORS and MIXED USE of both INDOORS & OUTDOORS. The new "GO" is Powerful at 4 watts with a 2000 mAh rechargeable Lithium-Ion Battery. This radio features a Rapid Rate Charger, PC Programmable Frequencies, PL, DPL, 3 Programmable Buttons: Repeater/Talk around, Scan, Lone Worker, Emergency, Voice Scramble Function, High/Low Power, and more. Setting to low power saves on battery operating time. The GO Radio can use 32 channels and has 2 channel zones, a maximum of 16 channels per zone. Programming is required to enable toggling between zones. Each channel can be set independently to either Analog or Digital mode. Free Radio frequency programming available, just send us a list of your frequencies. Radio programming requires the BlackBox USB Programming Cable. The latest programming software is available at blackboxradios.com. Instructions to program your radios can be found here. The software works on Windows XP, 7 and 10. The Blackbox GO is compatible with all Motorola M1 style accessories. 3 Programmable Buttons: Voice Scramble Function, Emergency Function and many more. Blucomm products, Blackbox 1100 mAh, 1350 mAh and 2000 mAh Batteries, Blackbox, Blackbox+ and Zone Programming Cables have a 6 Month Warranty. Blackbox+ Radios, Blackbox Zone and Zone KP, Blackbox-Mobile, Director, Patriot, Veteran, Seal, Go and Zone products have a 3 year warranty.